or ctrl-right to move the screen in 40 characters a time. The line of white background in line 23. Press Esc key to switch between COMMAND LINE and TEXT AREA. The blinking underscore(_) is called the cursor. The line just below the COMMAND LINE. 1. the name of the current file. 2. line & column numbers of the cursor. get file name in the STATUS LINE. The line below the STATUS LINE. showed in the MESSAGE LINE. Using Esc key to switch between COMMAND LINE and TEXT AREA. Using keys UP, DOWN, LEFT, RIGHT to move cursor in the text area. STATUS LINE shows column 41. Now type a letter 'a' in column 41. By pressing the HOME key, the cursor will be back to column of the line. moves the cursor after the last character in the line. The Ctrl-LEFT key combination moves the cursor 40 characters to the left. the line, ie column 255. A Personal Editor line is 255 column wide. Now return to column 1 by pressing the Ctrl-RIGHT key seven tomes. Press the Ctrl-HOME combination keys. The top of file marker appears. Keep an eye on the line indicator on the status line. Press the Ctrl-END keys. The bottom of file marker appears. Pressing the Ctrl-PgUp key will cause cursor to move to top of the screen. To move cursor to the bottom of the screen, press Ctrl-PgDn. work within the current screen.
! Keys ! Move cursor !
! Esc ! to switch cursor between COMMAND LINE and ! ! ! TEXT AREA. !
! Cursor Up ! up one space !
! Cursor Down ! down one space !
! Cursor Left ! left one space !
! Cursor Right ! right one space !
! Ctrl-LEFT ! 40 columns left !
! Ctrl-RIGHT ! 40 columns right !
! HOME ! to the first column of the line !
! END ! after the last character of the line !
! Ctrl-HOME ! to the top of the file !
! Ctrl-END ! to the bottom of the file !
! PgUp ! none (page of the text moving up) !
! PgDn ! none (page of the text moving down) !
! Ctrl-PgUp ! to the top of the current screen !
! Ctrl-PgDn ! to the bottom of the current screen !
! F9 ! to insert a line below the cursor !
! Ctrl-backspace ! to delete the line where cursor is standing !
! Ins ! to switch between Replace and Insert mode !
! Del ! to delete the character in the position of !
! Backspace ! to delete the character before the position ! ! ! of cursor !
! s-F1 ! to turn a page of the screen !
! s-F2 ! to reverse a page of the screen !
! Ctrl-ENTER ! to execute command in the COMMAND LINE without! ! ! regarding the position of cursor !
! F8 ! to switch between actives files ! replace them all at one time. To change that present string to the new string use s-F5 key. without type the command again. reads the first character after CHANGE command as the separator. the bottom of the file . the beginning of the line then to the top of the file. insert the new string exactly as ypu type. Purpose: The DEFINE command assigns a meaning to a key. is an internal file that you can rename and save. Purpose: The EDIT command switches between one active file and another. it on the diskette and reads it into memory if it exists. 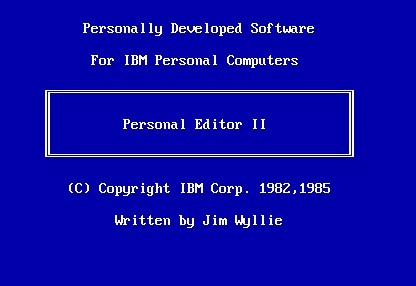 Otherwise, the Personal Editor creats a new file with that name. You can use F8 key to switch between the active files. compressed with the SAVE command. is not the usual procedure unless you want compressed text. 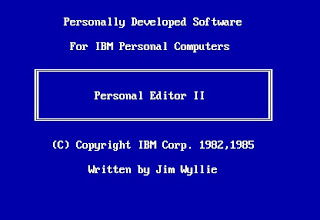 Purpose: The ERASE command deletes a file from diskette. save a file with the FILE command. 3. type with options notabs. The Personal Editor compresses the file as it saves. from the text in order to save diskette space. command inserts the spaces back into the file. statemants. Use the notabs option to prevent the errors. string from the cursor position. search without retyping the command. uppercase or lowercase when it searches for the string. of the commands in the order entered. Purpose: The NAME command changes the name of the current file. Remark: The new name will appear in the STATUS LINE. Purpose: The PRINT command prints the current file to the printer. line is printed. Press any key to continue. Check for these possible conditions and correct them. Purpose: The QUESTION MARK command displays the requested information. memory without writing it to diskette. message 'Are you sure? Type y or n ' in the status area. If you want to start over by removing the command, type N for NO. Typing Y for YES erases any changes you made since the last save. Remark: You can use the global characters ? and * with the file name. see FILE command for more information about notabs option. Purpose: The SET DISPLAY command changes the display of current file. reformat text inside these boundaries. value as the left margin. Remark: You can assign 20 tabs to a file between column 1 and 255. The numbers must follow in increasing order. The tab key is ->| and |<- on the keyboard. memory. You can use F8 to switch between active files.
. the number of active files in memory at one time.
. the number of lines in a file.
. bringing in new files to be edited including internal files.
. doing things with marked text.
. copying and shifting lines.
. adding or inserting lines in a file.
. the number of functions assigned to keys in the PR.PRO file. will spill the file and show the message 'SPILL FILE CREATED'. restricted from normal operation. This is explained below. the status line until memory is available.
. use the QUIT or FILE command to remove active files from memory. 'MEMORY FULL CONDITION ENDED' appears on the message line. You use line marks when you want to erase, copy, or move several lines. same as above, more you can use a-O to overlay an area.
! Types of ! Type of mark !
! Operation ! line ! block ! char ! ! ! Alt-L ! Ail-B ! Ail-C !
! copy ! line ! at ! at !
! Alt-Z ! above ! line ! line !
! delete ! any ! any ! any !
! Alt-D ! positi on ! position ! position !
! overlay ! X ! top left ! X !
! Alt-O ! ! corner ! !
! move ! line ! top left ! top left !
! Alt-M ! above ! corner ! corner !
! unmark ! any ! any ! any !
! Alt-U ! position ! position ! position ! the message 'type a character' will show in the message line. filled with the character you have just typed. Alt-F7: shifts text in marked area one position left. Alt-F8: shifts text in marked area one position right. Alt-P : reformats paragraph separated by blank lines to set margins. files provide information you can use when editing.